Nixon is best known for its designer watches. And while the company's audio gear shares the same design sensibilities that go into its fashionable timepieces, we've found they don't actually sound that great. Which is unfortunate, because this TPS speaker is lovely. Back in November we pitted Nixon's Apollo ear goggles against other budget headphones, and while they looked snazzy, in terms of sound quality they were the worst of the bunch. 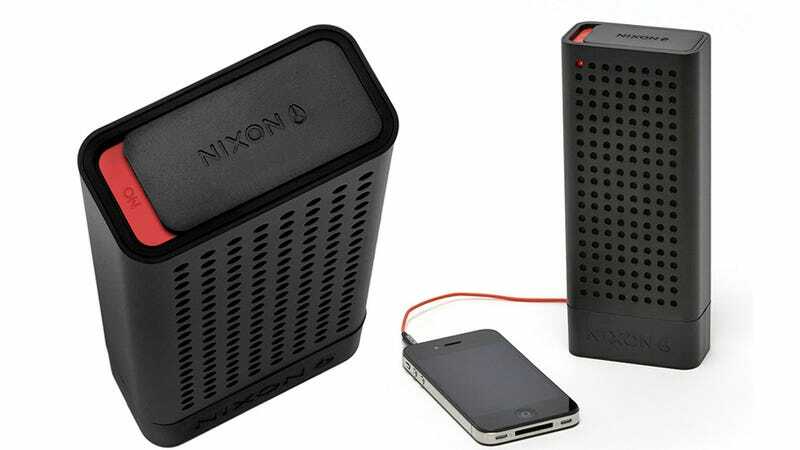 So we're hoping that Nixon has gotten its audio act together with its new TPS compact speakers. Their external housing features a simple perforated grill design with a generously-sized sliding power button on top. For $100 we would have liked them to come with some kind of wireless functionality, but even with a 6 hour rechargeable battery you'll still need to tether the speaker to an audio source with a 3.5mm headphone cable. And while you can daisy chain two of the speakers together for true stereo sound, that's still not enough to sway us from other solutions that include Bluetooth functionality for the same price.